This page is for customers who have completed a ticket purchase via Paypal. Thank you for your Paypal payment. Your transaction has been completed and a receipt for your purchase has been emailed to you. You may log in to your account at www.paypal.com to view details of this transaction. Please note that this is a provisional reservation subject to sea and weather conditions and availability. It is not a confirmed booking until we send you confirmation of that booking by email or text. If you haven’t yet done so please complete the booking form, or email info@venturejet.co.uk or call +44 (0)1348 837764 so that we know which days / times suit you and if you have any particular requirements. Please also ensure that we have at least one contact number for you so that we can confirm your booking and keep in touch re weather etc. One of our team will be in touch as soon as possible, by email, text or phone to confirm your booking and certainly within 24 hours. All trips, even with confirmed bookings, remain subject to sea and weather conditions for safety. Do please check for messages from us in case any issues develop with the weather or we need to alter timings slightly. If we can see any issues we’ll contact you giving you as much notice as possible and will reschedule or run an alternative trip if possible (charging accordingly), refund in full if not. Mobile reception can be tricky in Pembrokeshire so we usually text or email passengers rather than calling them (it’s also less intrusive). If you prefer to call us the evening or morning before your trip then please do on +44 (0)1348 837764. 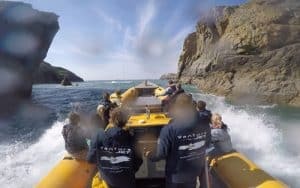 We usually operate from St Justinian, the lifeboat station, which is about 10 minutes’ drive from St Davids. The postcode for St Justinian is SA62 6PY but please use our directions and ignore the sat nav if it directs you off the main road. The RAC site is good for giving directions and approximate journey times but please allow plenty of time for holiday and slow farm traffic. You may find it helpful to look at this online map of St Davids and St Justinian. There are 60 steps or so leading down to the slipway; we have images of the departure point, steps and slipway online here. If anyone in your party has difficulty walking please let us know. It’s worth noting that there are no toilets at St Justinian (there are usually portaloos in main season in the bottom lay-by) but there are toilets in St Davids – at the Oriel Y Parc visitor centre on the left as you arrive in St Davids from Haverfordwest and next to the City Hall in the middle of St Davids – down a little path to the left of the City Hall as you’re facing it. If you’re approaching from Haverfordwest the City Hall will be on your left, just before Cross Square. If you’re approaching from Fishguard, follow the one-way system to the T junction and you’ll see the City Hall roughly in front of you on the other side of the road as you turn right to Cross Square in the middle of St Davids. There is limited parking in Cross Square but please be careful because the parking signage isn’t that clear. To get to St Justinian you’ll need to drive to Cross Square in the middle of St Davids. There’s a large stone cross in the middle of Cross Square, a memorial square / roundabout to the right of you and a white pharmacy on your left. Drive straight past the pharmacy (rather than following the road round the roundabout) and follow the sign to St Justinian ie down the hill (Goat Street). You’ll pass the Farmers Arms pub on your right as you go down the hill. The road does a sharp left at the bottom of the hill followed by a sharp right shortly before a sign saying Catherine Street. You then need to turn right (in about 100m, just after a pink cottage on the right) towards the cathedral then left, over a little bridge, following the sign to St Justinian. Pass Merryvale car park on your left and stay on that road for approximately 2 miles. Do please allow more time than you think you need to navigate our narrow lanes and holiday traffic; we suggest adding 15 minutes to half an hour to your expected journey time depending on how far you have to come to get to us. Parking arrangements are subject to change but the plan is to use different fields at St Justinian so please check for signs as you arrive at St Justinian. After parking keep walking towards the sea, past caravans and lay-bys on your left to the concrete steps down to the old lifeboat house. St Justinian is a tiny harbour and parking can be stressful in holiday periods if people don’t have plenty of time. We suggest that passengers aim to park at least 30 minutes before their trip. If at all possible we suggest that you arrive 45 minutes before your trip. During school holiday periods we suggest for your own convenience that you arrive 1 hour before your trip. That gives you time to park, find your way to the slipway and if you have spare time to just relax a bit before your trip. 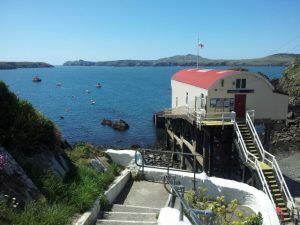 The lifeboat station is usually open so if you arrive early you can see the lifeboat or simply enjoy the coastal views. Our crew will collect you from the bottom of the concrete steps; please be there 15 minutes before your trip so that we can board you on time. Our crew will have your details. We regret that we cannot take responsibility for passengers arriving late. If you are running late ie you have not yet arrived at the parking field 30 minutes before your trip please contact us. If possible we will wait but out of respect for other passengers we can wait a maximum of 10 minutes. 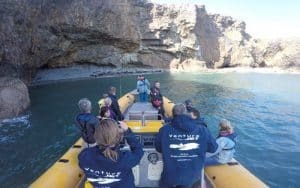 We will endeavour to accommodate passengers on a later sailing (subject to availability) but cannot guarantee availability, particularly in peak season. There are 4 boat companies which may be working; our boat is the only jet RIB and has yellow tubes and a yellow console. Please note: passengers need to be warmly dressed even if it’s a warm day because it’s always chillier out at sea than it is on land. We would suggest a minimum of 1 or 2 warm layers under a waterproof jacket. We have additional waterproof jackets on the boat which you’re welcome to borrow. Please wear trousers and footwear that you don’t mind getting wet and bring spares to put on after the trip – just to cover all bases! Please see our Booking page for more information on departure point etc; terms and conditions are on our FAQs page. We ask for 24 hours’ notice for cancellations but we appreciate as much notice as possible so that we can plan. Thank you for reading this far. One of the team will be in touch to confirm your booking as soon as possible. We look forward to meeting you for your trip.